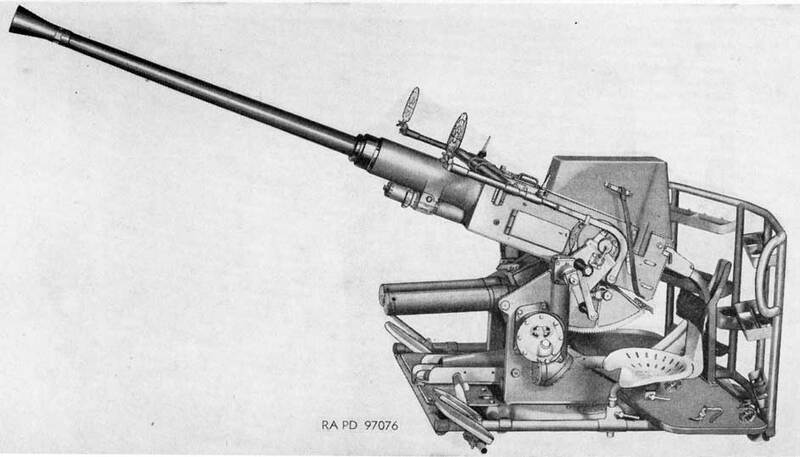 40 MM Antiaircraft Gun,TM 9-1252, 1951, is an Army service manual for this widely used anti-aircraft gun of WW II. We offer this manual on the web site because it covers the single 40mm mount M3 used on many small ships. 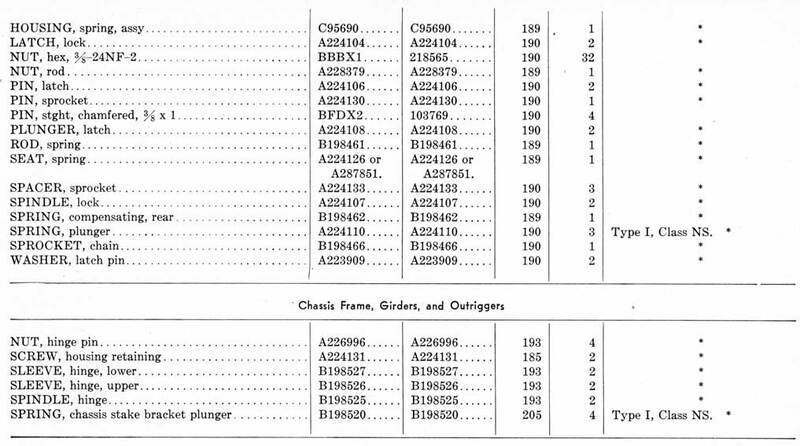 Note that the M1 gun is the same as found in the double and quad mount manuals also on this site. Only the first 215 pages have been replicated here. The trailer and the armored mount are not included. Authority for release of this document to a foreign government must be secured from the Assistant Chief of Staff, G-2. When this document is released to a foreign government, it is released subject to the following conditions: This information is furnished with the understanding that it will not be released to another nation without specific approval of the United States of America, Department of the Army; that it will not be used for other than military purposes; that individual or corporation rights originating in the information whether patented or not will be respected; and that the information will be afforded substantially the same degree of security as afforded by the United States of America, Department of the Army. This manual supersedes TM 9-1252, 24 April 1942, TM 9-1253, 24 April 1942, TB 9-1253-FE1, 11 November 1944, and those portions of TB ORD 256, 26 February 1945, pertaining to the materiel covered herein. TM 9-1252 is published for the information and guidance of all concerned. Tech Svc (2) except 9 (25); Arm & Svc Bd (2); AFF (2); AA Comd (2); OS Maj Comd (10); Base Comd (2); MDW (3); A (20); CHQ (2); D (2); R 9 (2); Bn 9 (2); C 9 (2); FC (2); Sch (5) except 9 (50); Gen Dep (2); Dep 9 (10); PE (Ord 0) (5), OSD (2); PG 9 (10); Ars 9 (10); Dist 9 (10); SPECIAL DISTRIBUTION. For explanation of distribution formula see SR 310-90-1. CHAPTER 5. GUN M1 AND DUAL GUN M2. CHAPTER 6. CARRIAGE M2A1 AND MOUNT M3. CHAPTER 7. TWIN MOUNT M4. This manual supersedes TM 9-1252, 24 April 1942, TM 9-1253,24 April 1942; TB 9-1253-FE1, 11 November 1944, and those portions of TB ORD 256, 26 February 1945, pertaining to the materiel covered herein. a. These instructions are published for the information and guidance of personnel responsible for afield and depot maintenance of this materiel. They contain information on maintenance which is beyond the scope of the tools, equipment, or supplies normally available to using organizations. This manual does not contain information which is intended primarily for the using arm, since such information is available to ordnance maintenance personnel in the pertinent operator's technical manuals or field manuals. b. 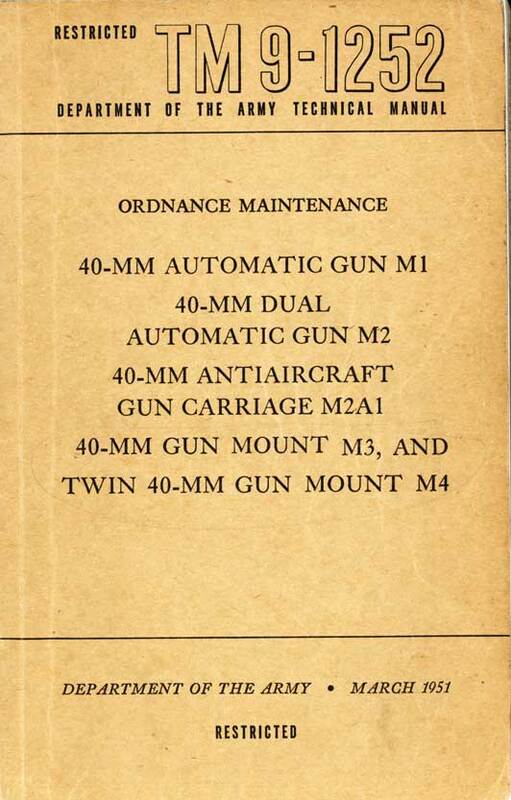 This manual contains a description of and procedures for disassembly, inspection, repair, rebuild, and assembly of the 40-mm automatic gun M1, 40-mm dual automatic gun M2, 40-mm antiaircraft gun carriage M2A1, 40-mm gun mount M3 and twin 40-mm gun mount M4. The appendix contains a list of current references, including supply catalogs, technical manuals, and other available publications applicable to the materiel. c. TM 9-251 and TM 9-252 contain operating and lubricating instructions for the materiel, and all maintenance operations allocated to using organizations in performing maintenance work within their scope. (a) 40-mm dual automatic gun M2. (b) 40-mm gun mount M3. (c) Twin 40-mm gun mount M4. (d) 40-mm AA gun carriage M2A1. (e) More complete instructions on inspection, tools, and maintenance (including depot maintenance). (b) 40-mm AA gun carriage M2. The publication of instructions for complete disassembly and rebuild is not to be construed as authority for the performance by field maintenance units of those functions which are restricted to depot shops and arsenals. In general, the prescribed maintenance responsibilities will apply as reflected in the allocation of maintenance parts listed in the appropriate columns of the current ORD 8 supply catalog pertaining to this materiel. Instructions for depot maintenance are to be used by maintenance companies in the field only when the tactical situation makes the performance of depot maintenance imperative. Provisions of parts listed in the depot-guide maintenance column of ORD 8 supply catalogs will be made to field maintenance only when the emergency nature of the maintenance to be performed has been certified by a responsible officer of the requisitioning organization. a. GENERAL. Forms, records, and reports are designed to serve necessary and useful purposes. Responsibility for the proper execution of these forms rests upon commanding officers of all units maintaining this materiel. It is emphasized, however, that forms, records, and reports are merely aids. They are not a substitute for thorough practical work, physical inspection, and active supervision. b. AUTHORIZED FORMS. The forms generally applicable to units maintaining this materiel are listed in the appendix. No forms other than those approved for the Department of the Army will be used. Pending availability of all forms listed, old forms may be used. For a current and complete listing of all forms, refer to current SR 310-20-6. Additional forms applicable to the using personnel are listed in the operator's manuals. For instructions on use of these forms, refer to FM 9-10.
c. FIELD REPORT OF ACCIDENTS. 10-40 series of special regulations. These reports are required whenever accidents involving injury to personnel or damage to materiel occur. (2) Ammunition. Whenever an accident or malfunction involving the use of ammunition occurs, firing of the lot which malfunctions will be immediately discontinued. In addition to any applicable reports required in (1) above, details of the accident or malfunction will be reported as prescribed in SR 385-310-1.
d. REPORT OF UNSATISFACTORY EQUIPMENT OR MATERIALS. 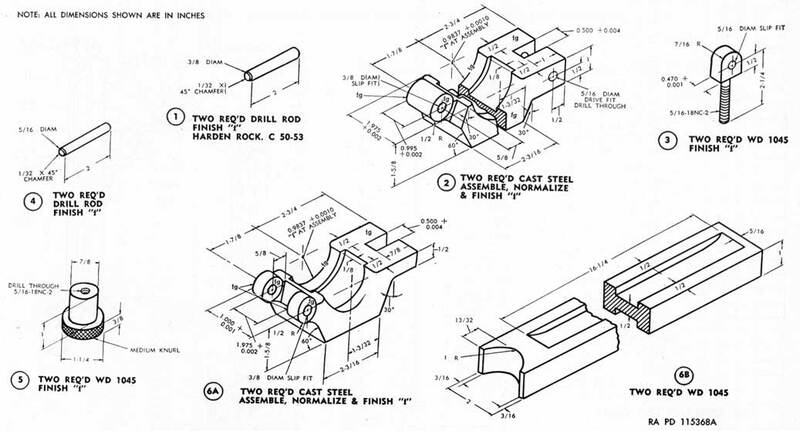 Any suggestions for improvement in design, maintenance, safety, and efficiency of operation prompted by chronic failure or malfunction of the materiel, spare parts, or equipment or as to defects in the application or effect of prescribed lubricants and/or preserving materials will be reported through technical channels as prescribed in SR 700-45-5 to the Chief of Ordnance, Washington 25, DC, ATTN : ORDFM, using DA AGO Form 468, Unsatisfactory Equipment Report. a. 40-MM AUTOMATIC GUN M1 (figs. 1 and 2). This gun is recoil operated and is intended primarily for antiaircraft fire but it may also be used against ground targets. It fires fixed ammunition in rapid bursts of automatic fire at the rate of 120 rounds per minute. It can also operate on single fire. The gun is equipped with a percussion type firing mechanism. b. 40-MM ANTIAIRCRAFT GUN CARRIAGE M2A1 (fig. 1): This carriage mounts the 40-mm automatic gun M1. It is of the 2-axle, 4-wheel, trailer type. A drawbar with a standard lunette forms the connection between the carriage and the prime mover. Spring suspension permits the wheels to spring independently of each other. The carriage is equipped with electric 4-wheel brakes operated from the prime mover and manually operated mechanical rear wheel brakes. Combination tail, stop, and blackout lights are provided. The carriage is equipped with manual and power operated elevating and traversing mechanisms. Manual elevation is between -6 degrees and +90 degrees. Power elevation is normally between zero and +88 degrees. Traverse is 360 degrees. The carriage is provided with a mechanical firing linkage operated by means of foot pedals. Figure 1. 40-mm automatic gun M1 and 40-mm antiaircraft gun carriage M2A1 in traveling position-side view. Figure 2. 40-mm automatic gun M1 and 40-mm gun mount M3. Figure 3. 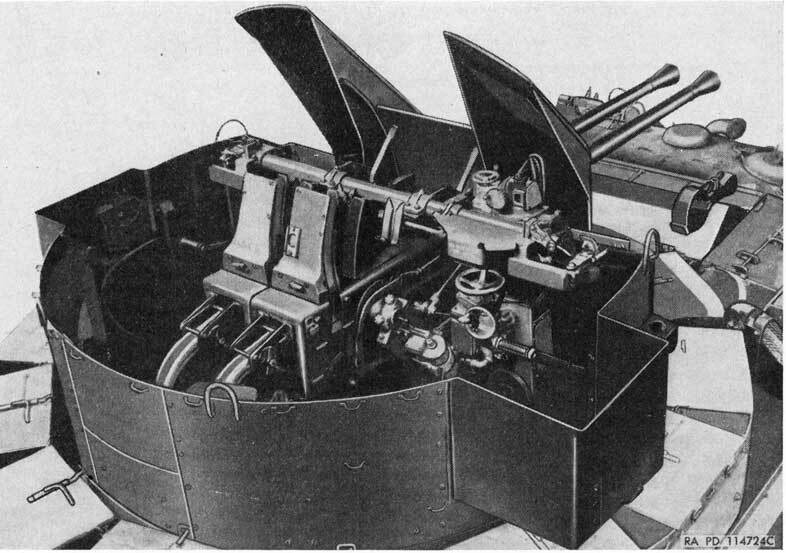 40-mm dual automatic gun M2 and twin 40-mm gun mount M4 on carriage M19A1-top view. Figure 4. 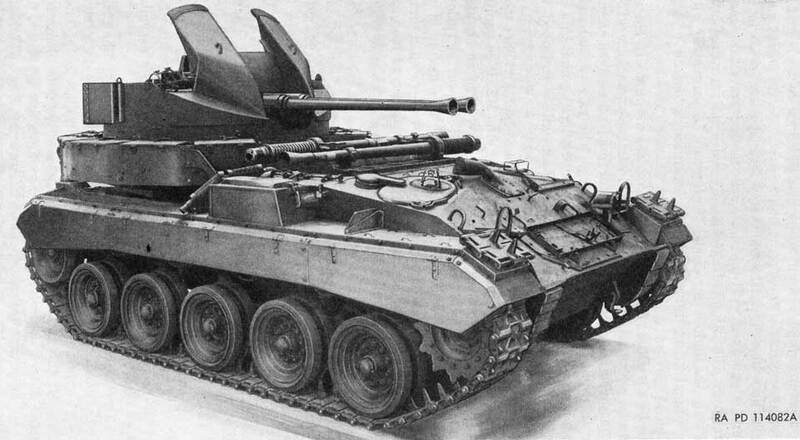 40-mm dual automatic gun M2 and twin 40-mm gun mount M4 on carriage M19A1-side view. c. 40-MM GUN MOUNT M3 (fig. 2). This mount accommodates the 40-mm automatic gun M1 and is designed to be bolted to a pedestal or vehicle. It was originally produced for naval vessels but is now also issued to the Army Transportation Corps. The mount is equipped with manual elevating and traversing mechanisms only. Elevation is between -6° and +90°; traverse is 360° but can be limited by stops. The mount is provided with a mechanical firing linkage which is operated by means of a foot pedal. d. 40-MM DUAL AUTOMATIC GUN M2 (figs. 3 and 4). This gun is recoil operated and is intended primarily for antiaircraft fire but may also be used against ground targets. It fires fixed ammunition in rapid bursts of automatic fire at the rate of 120 rounds per minute from each of the guns comprising the dual gun. The gun can also operate on single fire. Each gun is equipped with a percussion type firing mechanism. e. TWIN 40-MM GUN MOUNT M4 (figs. 3 and 4). This mount accommodates the 40-mm dual automatic gun M2. It is equipped with manual and power elevating and traversing mechanisms. Manual elevation is between -3° and +87°. Power elevation is between -3° and +85.° Traverse is 360°. The mount is provided with mechanical firing linkage which is operated by means of a foot pedal or electric hand triggers. The gun and mount are part of the twin 40-mm gun motor carriage M19A1. a. GUN M1 AND DUAL GUN M2. (1) Automatic loaders (fig. 29). 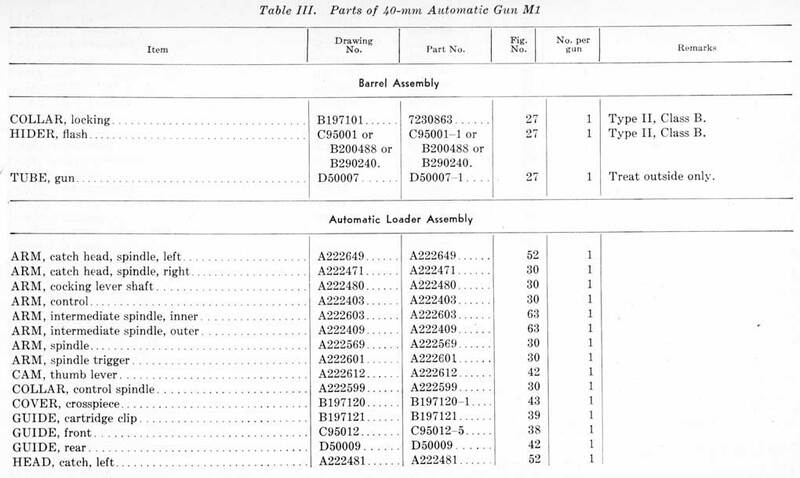 The left automatic loader for the dual gun M2 is identical to that for the gun M1 but the right loader is symmetrically opposite. Loaders are not interchangeable. (2) Breech ring assemblies. 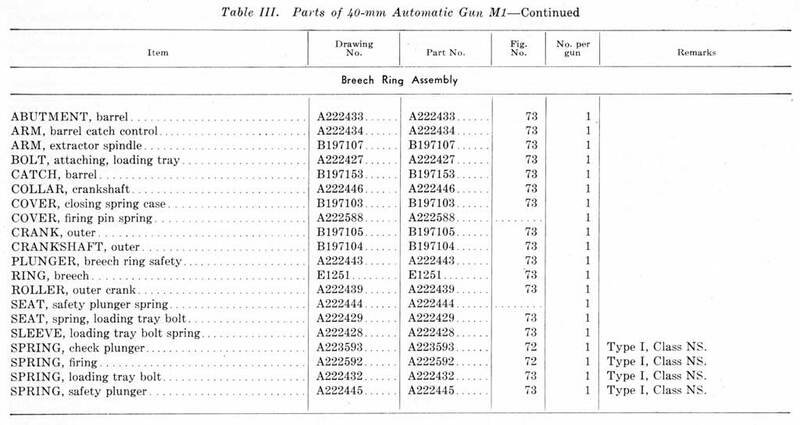 The breech ring assemblies for the dual gun M2 are very similar to the one for the gun M1, the chief differences being in the design of the breech ring and safety plunger. 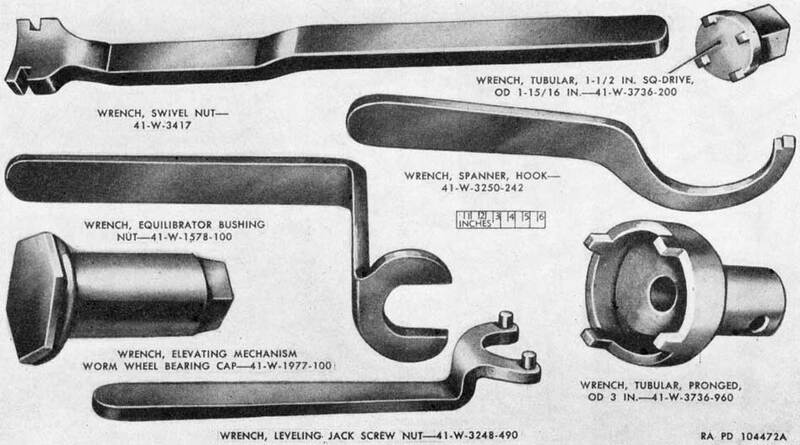 Breech ring assemblies are not interchangeable; breechblocks are. (3) Breech casing assemblies (figs. 90 and 91). The breech casing of the dual gun M2 consists of two symmetrically opposite bodies, each of which is similar to the casing of the gun M1. 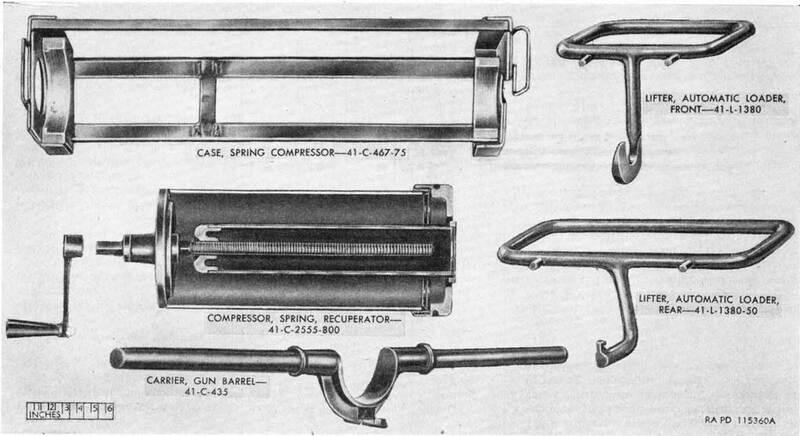 Breech casings are not interchangeable. Standard threads. The interrupted threads at the breech end of the tube are the same regardless of type of manufacture. Barrel assemblies with metric threads will be replaced with those having National Standard threads. (1) Traversing and elevating mechanisms. The mount M3 has manual traversing and elevating mechanisms only; the mount M4 and carriage M2A1 can be traversed manually or by power. The traversing ratio of the mount M3 is much lower and direction of rotation is reversed (clockwise rotation of crank produces clockwise traverse of top carriage) in comparison with the carriage M2A1 and mount M4 (par. 6 b, c, and d). 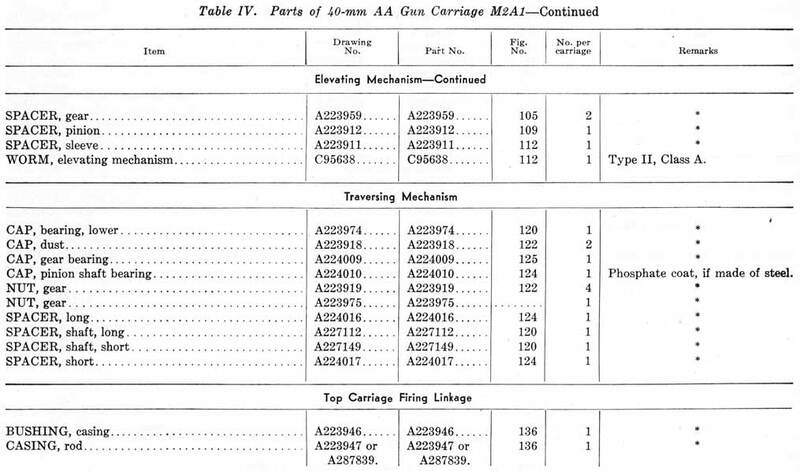 (2) Firing linkages. The firing linkage of mount M4 is operated by means of a foot pedal or electric hand triggers while those of mount M3 and carriage M2A1 are operated by foot pedals only. a. 40-MM AUTOMATIC GUN M1 AND 40-MM DUAL AUTOMATIC GUN M2. Weight of barrel assembly 271.5 lb. Weight of gun M1 without barrel assembly 765 lb. Weight of dual gun M2 without barrel assemblies 1575 lb. Length 7 ft. 4 1/2 in. Taper per inch 0.051 in. Length 6 ft. 3.85 in. AP-T shot and HE-T shell 2,870 fps. AP-T shot, horizontal at 711.1 mils 9,475 yd. Horizontal (limited by SD tracer) 5,200 yd. Vertical (limited by SD tracer) 5,100 yd. Gun M1 120 rd. per min. Gun M2 240 rd. per min. Capacity of automatic loader 7 rd. Capacity of cartridge clips 4 rd. Maximum safe recoil 8.3 in. Capacity of recoil cylinder 1.32 pt. b. 40-MM ANTIAIRCRAFT GUN CARRIAGE M2A1. Weight of carriage with oil gears aprx. 4,800 lb. Weight of complete weapon with computing sight aprx. 5,950 lb. Wheelbase 10 ft. 6 in. Track (center to center of wheels) 4 ft. 7 3/8 in. Overall length (traveling) 18 ft. 9 1/2 in. Overall width (traveling) 6 ft. Overall height (traveling) 6 ft. 7 1/2 in. Overall height (firing, maximum elevation) 13 ft. 9 in. Minimum turning diameter 38 ft.
(Power cut-off by elevation limit switch for remote control normally set at 87 degrees for remote control system M15). (Power cut-off by elevation limit switch for remote control normally set at -4°). Rate of traverse per turn of handcrank 17° 8.4 min. c. 40-MM GUN MOUNT M3. Weight of mount 1,212 lb. Weight of mount and gun less sighting equipment 2,248 lb. Overall length of gun and mount at zero elevation 12 ft. 7 5/8 in. Overall width of gun and mount 5 ft. 8 3/4 in. Overall height of gun mount at zero elevation 4 ft. 3 1/4 in. Overall height of gun and mount at maximum elevation 12 ft. 6 3/8 in. Length of mount alone 6 ft. 8 3/8 in. Distance from center of trunnion to bottom of base 2 ft. 8 7/8 in. Traverse (either direction) 360° limited by stops installed at installation of mount. Rate of traverse per turn of handcrank 6° 4.2 min. d. TWIN 40-MM GUN MOUNT M4. Weight of mount (aprx.) 6,800 lb. Diameter of platform 12 ft. 1 in. Rate of elevation (by power) 25° /sec. Rate of traverse per turn of hand crank 10° 18 min. Rate of traverse (by power) 40°/sec. e. SIGHTING AND FIRE CONTROL EQUIPMENT. System, remote control, M10 or M15. System, sighting, M3 is considered part of mount M3 per ORD 3 SNL A-1, Section 2. 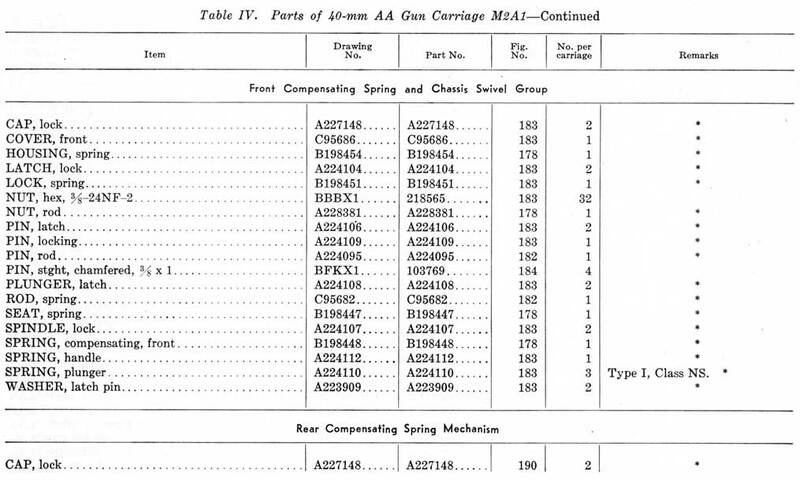 Sight, computing M13A1 or M13 (on carriage, motor, M19A1). This chapter provides specific instructions for the technical inspection by ordnance maintenance personnel of materiel either in the hands of troops or when received in ordnance shops for repair. It also briefly describes the in-process inspection during repair or rebuild and final inspection after repair or rebuild has been completed. Inspections are made for the purposes of-determination of the condition of an item as to serviceability; determination of incipient failure; the assurance of proper application of maintenance policies at prescribed levels; and the ability of a unit to accomplish its maintenance and supply missions. In general, three types of inspections are performed by ordnance maintenance personnel. a. TECHNICAL INSPECTION. This is a periodic overall inspection performed on materiel in the hands of troops or when received for repair in field or depot maintenance shops. The procedures to be followed in the above technical inspections are covered in detail in section II. (a) Determine serviceability, i.e., the degree of serviceability, completeness, and readiness for immediate use, with special reference to safe and proper functioning of the materiel. If the materiel is found serviceable, it will be continued in service. In the event it is found unserviceable or incipient failures are disclosed, the deficiencies will be corrected on the spot or advice given as to corrective measures, when applicable or, if necessary, the materiel will be tagged for delivery to and repair by ordnance maintenance personnel. (b) Check causes of mechanical and functional difficulties that troops may be experiencing and for apparent results of lack of knowledge, misinformation, neglect, improper handling and storage, security, or preservation. (c) Check on application of all authorized modifications; see that no unauthorized alterations have been made or that work beyond the authorized scope of the unit is being attempted. (d) Instruct the using personnel in proper preventive maintenance procedures, where found inadequate. (e) Check on completeness of the organizational maintenance allowances and procedures for obtaining replenishments. (f) Check conditions of storage of general supplies and ammunition. (g) Initiate a thorough report on materiel on "deadline," with reasons therefore, for further appropriate action. (h) The inspector should report to the responsible officer any carelessness, negligence, unauthorized modifications, or tampering. This report should be accompanied by recommendations for correcting the unsatisfactory conditions. (2) Inspection of materiel in ordnance shops. A technical inspection similar to (1) above is also made of materiel turned in to field and depot maintenance shops for repair, overhaul, and rebuild. In addition, the inspector determines the extent of repairs necessary and prepares an estimate of the parts required. He also performs a trouble shooting inspection, as necessary, to localize and diagnose any malfunctions. Trouble shooting information is given in chapters 5, 6, and 7, where applicable, for each major unit. repairing or rebuilding the materiel and its components. This is to insure that all parts conform to the prescribed serviceability standards, that the workmanship is in accordance with approved methods and procedures, and that deficiencies not disclosed by technical inspection are found and corrected. Detailed instructions are contained in chapters 5, 6, and 7 as a normal phase of maintenance (repair, overhaul, and rebuild) of each major unit. c. FINAL INSPECTION. This is an acceptance inspection performed by a final inspector, after repair, overhaul, or rebuild has been completed, to insure that the materiel is acceptable according to the repair, overhaul, and rebuild standards established in TB ORD 256. Detailed instructions are given in chapter 8. Warning: Before starting a technical inspection, clear the weapon. Make certain there is no ammunition left in chamber, on loading tray, or in upper part of loader. Place all ammunition at a distance from place of work. (1) Check to see that the materiel has been cleaned of all rust preventive compound, grease, excess oil, dirt, or foreign matter which might interfere with proper functioning or obscure the true condition of the parts. (2) Record the serial numbers on the inspection form. (3) Make an overall inspection of materiel for general appearance, condition, and loose, missing, or broken components. b. ARTILLERY GUN BOOK ( 00 FORM 5825). Examine the gun book to make sure that this record has been kept up to date and that all entries have been properly made. The responsible officer will be advised of any such failures. c. LUBRICATION. See if lubricating fittings, oilholes, and plugs are properly identified by a red circle surrounding them and bearing and sliding surfaces, hinge joints, latches, and other movable parts are clean, well lubricated, and free from rust or other foreign matter. 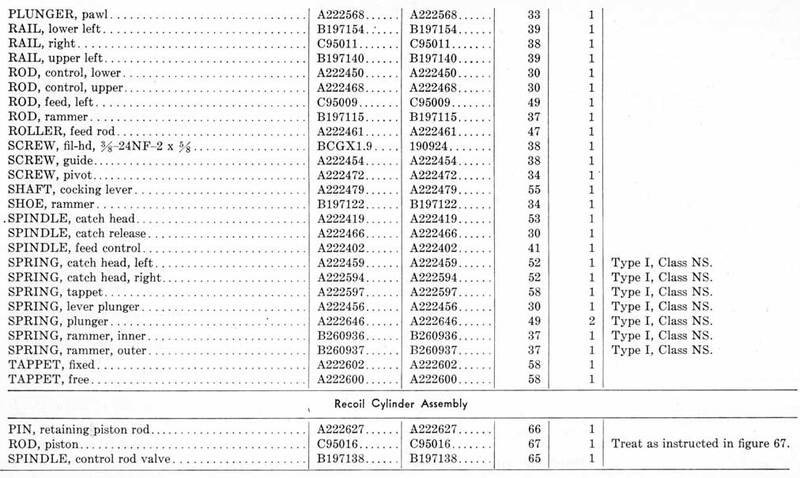 Check to see that the materiel is properly lubricated in accordance with LO's 9-252, 9-252-1, and 9-757.
d. MODIFICATIONS. Check if all authorized modifications have been applied. 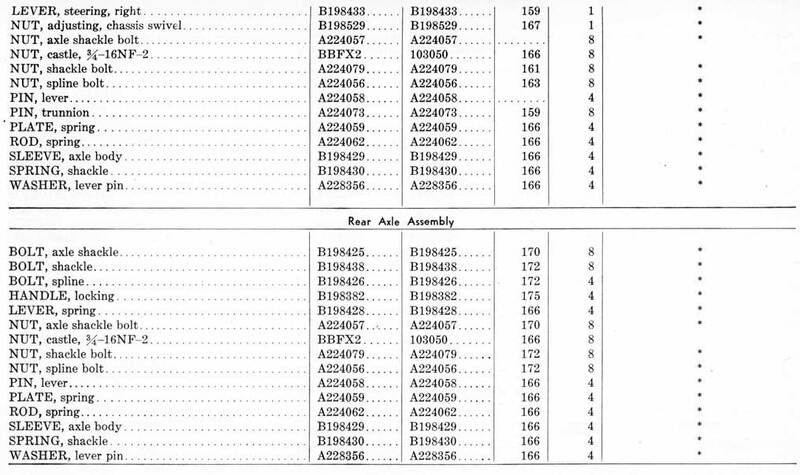 The list of MWO's in paragraph 220 was current at the time this manual was prepared; for a complete listing of all current MWO's, refer to SR 310-20-4.
e. NAME PLATES. Check to see if lettering on name, direction, and caution plates is legible. f. SAFETY FEATURES. Inspect all safety features for functioning. g. OPERATING MECHANISMS. Inspect all operating mechanisms for ease of operation, backlash, and proper lubrication. h. COMPLETENESS. Inspect the gun and carriage or mount for missing bolts, rivets, screws, nuts, pins, and equipment. i. CRACKS. Inspect plates, castings, and welds for cracks and breaks. j. PAINTING. If paint has deteriorated or become damaged, leaving exposed portions of bare metal, the materiel should be repainted. Follow instructions in TM 9-2851.
k. SPARE PARTS AND EQUIPMENT. Inspect these for completeness and serviceability. Inspect covers for the weapon and fire control equipment. l. EXERCISING. Ascertain if the weapon has been fired or exercised weekly, in accordance with TM 9-251 or TM 9-252, while in the hands of the troops. (1) General. 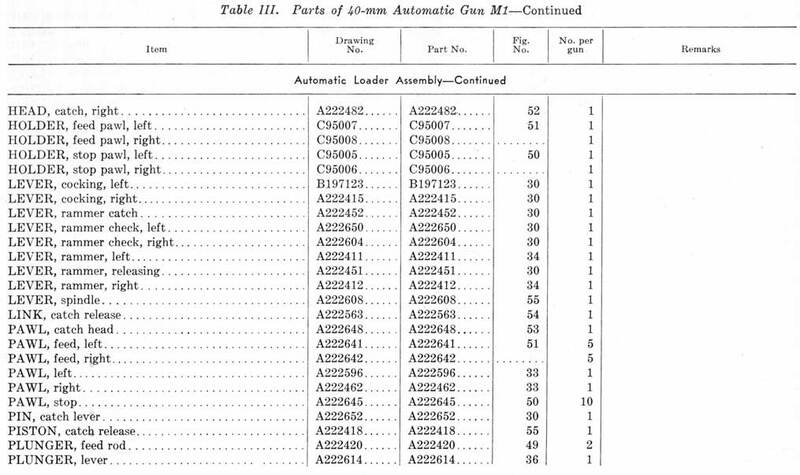 In order to inspect the barrel assembly of either gun, it is necessary to remove the assembly (TM 9-251 or TM 9-252). (2) Bore. Examine the bore for dirt, grit, rust, and deformation of the lands and grooves; note pitting and nicks. Examine for evidence of powder fouling; do not confuse coppering of the bore with powder fouling. Refer to TB 9-1860-2 for evaluation of erosion and damage in bore. (3) Recuperator spring, guide sleeve, and locking collar. Examine the recuperator spring for breaks or cracks and see that the guide sleeve and locking collar are in good condition and properly secured with the locking screw and disk. Defective parts will be replaced. b. BREECH RING. Inspect the breech ring before installing the barrel assembly. See that the threads of the breech ring are clean and smooth. Complete inspection of the breech ring and breech ring stop pad necessitates removal of the breech ring assembly (TM 9-251 or TM 9-252). screws are tight and dowel pins for the stop pawl assemblies are in place and tight. The feed rods should move smoothly in the frames, without bind. See that the guides are smooth and clean and that the rails are in good condition and the retaining screws tight. See that the clip guide is free from burs and that the retaining screws are tight. (b) With the safety lever set at "SAFE" (gun M1) or "STOP FIRE" (dual gun M2) and the gun cocked, depress the firing pedal. The rammer should not be released with the safety lever in this position. (c) With the operating handle engaged in the rear latch bracket, depress the firing pedal. The rammer should not release. (3) Feed control mechanism. With the feed control thumb lever to the left (gun M1 or left loader on gun M2) and no rounds in the loader, the rammer should not release. With the lever to the right, the rammer should release. For the right loader on the gun M2, the rammer should not release with the lever to the right. (1) Inspect the cylinder for leaks, dents, or cracks. Check to see that cylinder is filled to correct level with proper type of fluid. See that the adjustment plate is fastened securely and that the filling and drain plugs are tight. See that the locking screws for the collar and the control rod are in place and tight. (2) Check gun book to ascertain if gun has been fired at a recent date. If it has not, exercise as outlined in TM 9-251 or TM 9-252.
good condition and that covers close properly. The body elevation plate must be clean and legible. (2) Breech operating mechanism. Operate the breech mechanism with the operating handle and note whether the mechanism works smoothly and freely. Open the side cover and examine the cam surface inside the cover to see that it is smooth and clean. Inspect the roller on the breech ring outer crank to see that it is smooth. See that the operating rod contacts the breech ring outer crank firmly. 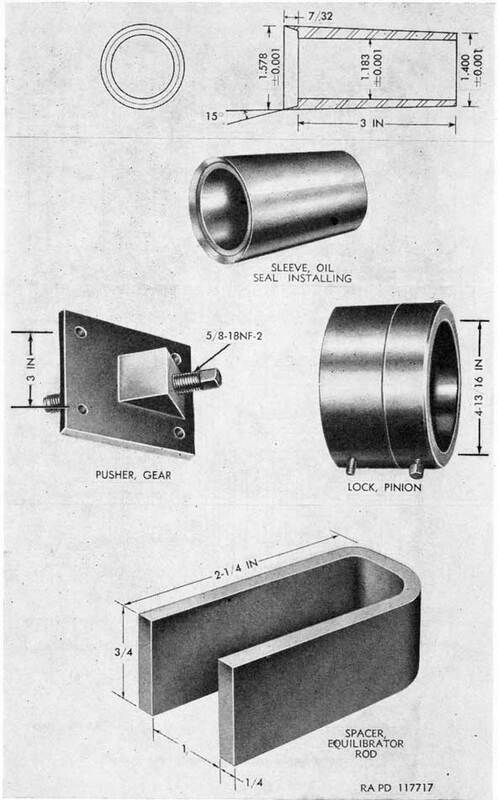 (3) Breechblock assembly. Refer to TM 9-251 or TM 9-252 for removal, disassembly, and inspection of the breechblock assembly. (4) Top cover. See that the caution plate or stenciling on the cover is clean and legible. 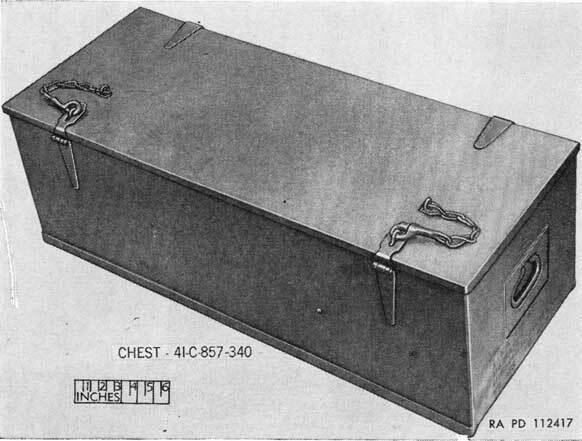 Open the cover and examine the barrel catch. The catch must fit firmly into its slot in the tube when the cover is closed. (5) Rear cover assembly. See that the cover closes properly and that the retaining bolt and nut are tight. Inspect the cartridge deflector for breaks and see that the recoil indicator is in serviceable condition. (6) Breech casing firing linkage. See that the firing lever at the trunnion makes light contact with the firing plunger when firing pedal is released. Further inspection of the breech casing firing linkage necessitates removal of the automatic loader assembly (TM 9-251 or TM 9-252). (7) Elevating gear sector. Examine the sector for dirt, nicks, or abrasions. Elevate the gun and observe whether there is binding between the sector and pinion. See that the sector is securely bolted to the breech casing. a. Inspect gear case for leaks and proper lubrication. b. Operate hand crank and note whether the mechanism runs smoothly and freely through full range of elevation. c. Attach a torque meter to the hand adapter. Elevate and depress the gun throughout the entire range, noting the torque readings. (1) For the carriage M2A1 and mount M3, the maximum torque at the hand crank shaft must not exceed 50 inch-pounds between 5° elevation and 80° elevation. Torque must not exceed 60 inch-pounds at points below 5° and above 80° elevation. pounds between 5° elevation and 80° elevation. It must not exceed 125 inch-pounds at points below 5° and above 80° elevation. (1) Carriage M2A1. With the gun approximately horizontal, mount a collimator or telescope on the breech casing. Secure a wire to the oil gear shaft to serve as a pointer. Elevate the gun and sight the collimator on a distant object. Do not overpass. Without moving the gun, scribe a mark to coincide with the wire pointer on the 5 3/8-inch flange diameter of adapter housing-B198355 (fig. 107). Elevate the gun approximately one-half turn of the hand crank. Depress the gun until the intersection of collimator reticle lines falls on the original reference point. Do not overpass. The position of the wire pointer must coincide with the scribed mark on housing-B198355 within 1/8 of an inch. (2) Mount M4. Check the elevating mechanism of the mount M4 in the identical manner as outlined for the M2A1 carriage (1) above, but scribe the markings on the 5 3/8-inch flange diameter of adapter housing-7219218 (fig. 107). The final position of the pointer must coincide with the scribed mark within 3/16 of an inch. (1) Adjust the gun in horizontal position. (2) Install the scale component of the backlash gage on the bearing adapter (figs. 19 and 252). (3) Install the vernier component of the backlash gage on the output drive coupling and adjust the knurled knob until the gage reads zero (figs. 19 and 253). (4) Twist the coupling rubber seal one way until the barrel begins to move, stop, and record the reading. Now twist the seal the other way until the slack is taken up without moving the barrel, stop, and record the reading. A bore sight, a gunner's quadrant, or a suitable telescope clamped to the gun and sighted on a target should be utilized to detect motion of the barrel. (5) For the carriage M2A1, total backlash must not exceed 2° and 13 minutes. For mount M4, total backlash must not exceed 3° and 17 minutes. Note. 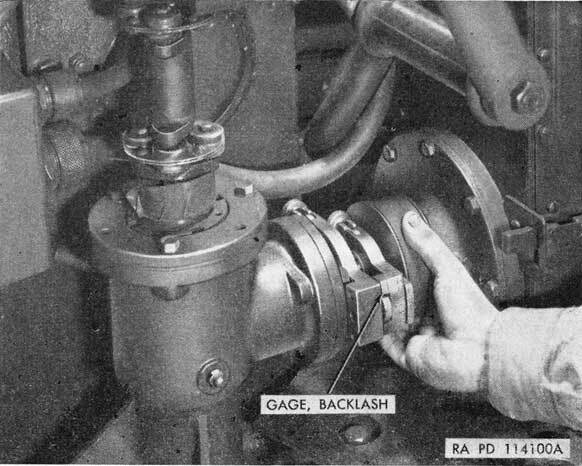 The backlash gage shown in figure 19 is intended to serve as a guide only; similar or different gages can be improvised, depending on local conditions. However, the principles of backlash measurement, as described herein, will still hold. The operations illustrated in figures 252 and 253 are applicable to the elevating mechanisms assembled to the carriage. f. Inspect the equilibrator cases for dents or breaks. Inspect the equilibrator connecting bar for loose, damaged, or worn parts. Refer to section I of chapter 6 for repair and adjustment of equilibrators. b. Traverse the gun through full range, first in one direction and then in the other, and check for smoothness and ease of operation. c. Attach a torque meter to the hand adapter and traverse the gun 360 degrees clockwise and counterclockwise, noting the torque readings. The maximum torque at the hand crank shaft must riot exceed 90 inch-pounds for the carriage M2A1 and mount M4; for the mount M3, it must not exceed 30 inch-pounds. (1) Carriage M2A1. With the gun approximately horizontal, mount a collimator or telescope on the breech casing. Secure a wire to the azimuth oil gear shaft to serve as a pointer. Traverse the gun either to the right or left, sighting the collimator on a distant object. Do not overpass. Without moving the gun, scribe a mark, to coincide with the wire pointer, on the 4 1/2-inch flange diameter of the bearing adapter-B198412 (fig. 122). Traverse the gun in the same direction as originally, about one-half a turn of the hand crank. Reverse the direction of rotation until the intersection of the collimator reticle lines fall on the original reference point. The position of the wire pointer must coincide with the scribed mark on the bearing adapter-B198412 within 1/16 of an inch. (2) Mount M4. Check the traversing mechanism of the mount M4 in the identical manner as outlined for the M2A1 carriage ( (1) above). However, the final position of the pointer must coincide with the scribed mark within 3/32 of an inch. (1) Install the scale component of the backlash gage on the bearing adapter (figs. 5 and 19). (2) Install the vernier component of the backlash gage on the output drive coupling (figs. 5 and 19). (3) By means of the knurled knob, adjust the backlash gage to read zero. Figure 5. Measuring backlash of traversing mechanism. coupling seal the other way until the slack is taken up without moving the barrel, stop, and record the reading (fig. 5). A bore sight or a suitable telescope clamped to the gun and sighted on a target should be utilized to detect motion of the barrel. (5) Total backlash should not exceed 1° and 41 minutes for carriage M2A1 and 2° and 5 minutes for mount M4. Note. 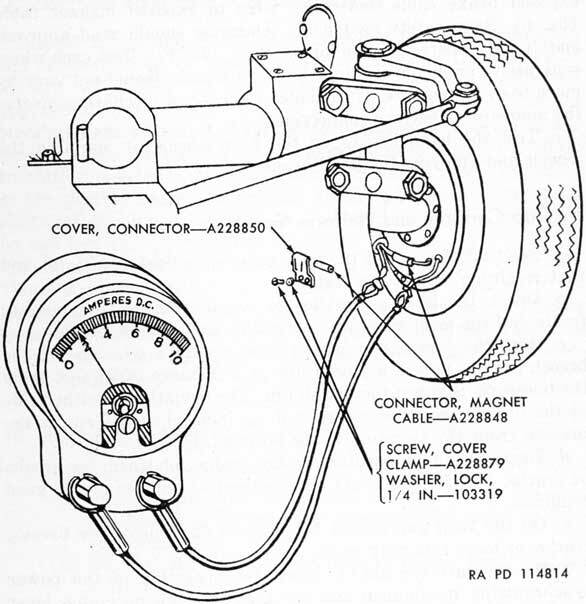 Operations illustrated in figure 5 are also applicable to the carriage M2A1. f. To inspect the ring gear, remove the inspection cover, located at the left side of the top carriage, and observe the ring gear while the gun is slowly traversed. Be careful that no dirt or other foreign matter enters the inspection opening. Install the cover. g. Examine the coupling assembly for worn, damaged, or broken parts. See that the rubber spacer of this assembly is in good condition (carriage M2A1 and mount M3 only). a. GENERAL. 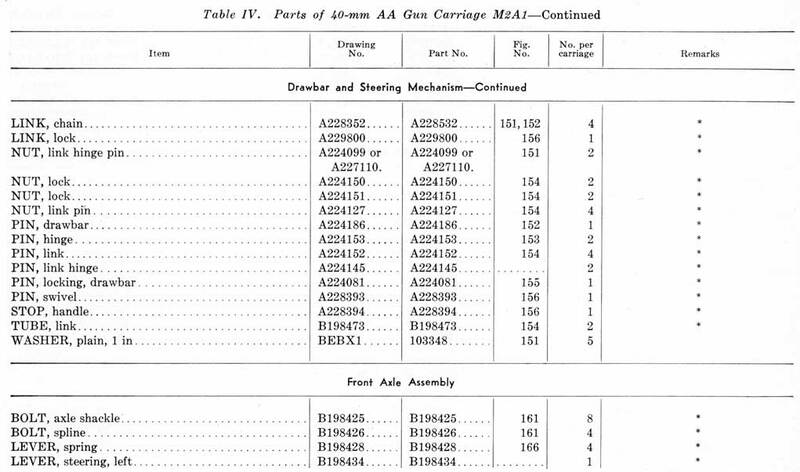 This paragraph describes the inspection of the chassis assembly for the carriage M2A1. b. DRAWBAR AND STEERING MECHANISM. Inspect for worn, bent or damaged links, clevis pins, or drawbar connector bolt. See that the lunette is in good condition and tight. c. FRONT AND REAR AXLES AND CROSSHEADS. Inspect for worn, bent, or damaged shackles, shackle bolts, or wheel spindles. Look for worn or damaged bushings in the shackles. The shackles should incline downward from the axle body. If they are horizontal or slope upward, the shackle lever springs may be weak, improperly assembled, broken, or out of adjustment. Refer to chapter 6, sections VIII and IX, for maintenance instructions of the front and rear axle assemblies. d. GUN STAY. Inspect the gun stay for bent or damaged frames. See that the plungers lock the gun securely. See that the gun stay handle plungers lock the gun stay to the rear axle firmly. e. FRONT AND REAR COMPENSATING SPRINGS. 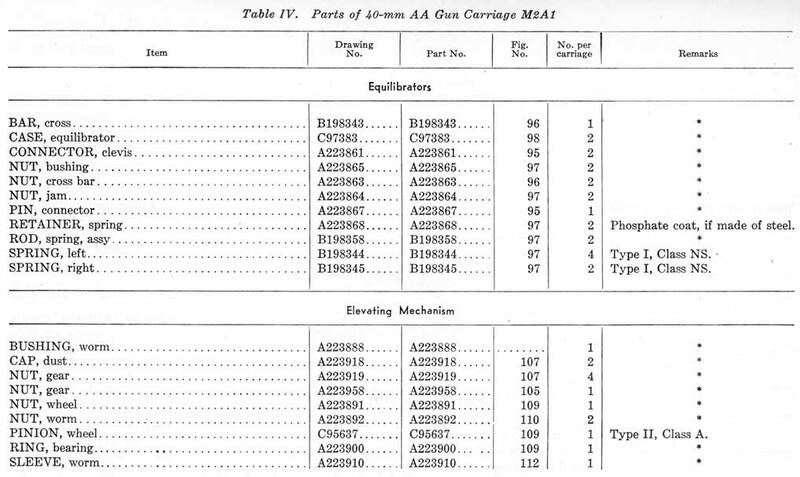 Lower the gun carriage to firing position and raise to traveling position to test the action of the compensating spring assemblies. Warning. Failure to observe all safety precautions when lowering or raising the carriage will result in serious injury to personnel. For correct procedures, refer to TM 9-252. The drawbar and gun stay should rotate the axles firmly and the spring action should control movement of the carriage so that it may be lowered or raised with a smooth, steady action. Jerky or erratic movement indicates faulty spring action, lack of correct engagement of the locks with the locking arcs, or a bent axle. Check to insure that the rear chassis compensating spring lock engages the lower rear chassis locking arc in all five locked positions with the carriage in firing position. Refer to chapter 6, sections X and XI, for maintenance instructions of the compensating spring assemblies. f. FRAME, OUTRIGGERS, AND LEVELING JACKS. (1) Examine the chassis frame and the outriggers for breaks or cracks and see that all welded joints are in good condition. (2) Inspect the hinges of the outriggers by extending them and observing whether they move freely and lock properly in either position. Watch for looseness of the hinge spindle caused by worn bushings or spindle. (3) Operate all leveling jacks and observe whether they move smoothly in the jack tubes. See that the cranks lock securely to the caps. Examine the foot plates for breaks or bends and see that they move freely in their sockets. (4) Refer to chapter 6, section XII, for maintenance of the outriggers and chapter 6, section XV, for maintenance of the leveling jacks. g. CHASSIS FRAME AND WHEEL ALINEMENT. Improper frame alinement may occur as the result of an accident and should be corrected in order to prevent undue strain on various assemblies and improper wheel alinement. Refer to chapter 6, section XIV, for information on how to check and correct frame and wheel alinement. a. Inspect the wheels, wheel rims, and wheel rim flanges for indentations and cracks and inspect retaining nuts and studs. Wheel stud holes should not show appreciable wear. Figure 6. Checking current at brakes. be made in accordance with approved methods to prevent further damage. Refer to TM 31-200.
c. Raise the wheels with the leveling jacks. Attempt to shake the wheels to determine if they are loose. Looseness of the wheels may indicate improperly adjusted, worn, or damaged wheel bearings. While the wheels are off the floor, release the brakes and spin each wheel. Observe whether the wheels wobble and whether the brakes drag. Tire rims must be concentric with the wheel spindle within 1/8 inch and must not have a sidewise runout greater than 3/32 inch. Spin all four wheels and place the safety switch in the "ON" position to test brake action. All wheels should stop immediately. d. If voltage of battery is less than 6 volts, attach a 6-volt battery to jumper cable (fig. 217). With the wheels still off the floor, remove connector cover from backing plate and disengage one of the connections, including the cable connector (fig. 6). Connect one wire of ammeter-17-A-6730 (fig. 12) to end of exposed brake cable and other wire to exposed magnet cable (fig. 6). Snap safety switch on. Ammeter should read approximately 2.2 amperes at shop temperature (70° F.). Test each wheel separately; ammeter readings between wheels should not vary by more than 0.5 ampere. If ammeter indicates a discharge, reverse the ammeter or battery connections. e. Test the hand brakes on the rear wheels by spinning the wheels and applying the hand brakes. a. See that the seal at the base provides a dustproof joint and that retaining screws are tight. b. Check the level assemblies to see that the covers operate freely and the level vials are serviceable and clearly visible. c. With the carriage or mount level, mount a telescope on the breech casing. Locate a plumb line at a distance of 27 feet from the telescope. Sight at the plumb line. The deviation on either side of the plumb line must not exceed 3/32 inch when the gun is depressed from 45° elevation to the horizontal. d. Inspect the frame plates and the loading platform for breaks or cracks. See that the seats and footrest assemblies are in good condition. e. On the twin gun mount M4, inspect the shields for breaks, cracks, or loose retaining parts. f. On the carriage M2A1, check the operation of the power synchronizing mechanism and see that the slewing clutch lever operates properly (TM 9-252). g. Examine the cartridge chute assembly and cover and the chute support angles for breaks or loose retaining parts. h. Check functioning of elevating and traversing locks of mounts M3 and M4; these should operate without binding and lock the mount securely without free play. i. See if the elevating limit switch cam cover has been modified in accordance with drawing B198442, revision 7 (carriage in 2A1) (depot maintenance only). j. Inspect the firing linkage of the top carriage to see that it is correctly adjusted and that all parts are in good condition. Check for weak or damaged springs in the linkage. Operate the firing pedals and observe whether they actuate the linkage without excessive free travel. See that the front pedal clears the elevation operator's right footrest by at least 3/4 inch when fully depressed (carriage M2A1). Inspect cables and electrical connections for worn insulation and exposed, dirty, or loose connections. Measure the voltage of the dry cell battery. (A new battery should show a reading of approximately 6 volts.) Test the stop and tail lamps and the blackout light switch. A 6-volt battery may be connected to the jumper cable for making electrical equipment tests (fig. 217). Insulation resistance, as measured under normal room conditions in the electric brake and lighting systems, between ungrounded electrical circuits and ground and between isolated circuits, will be not less than 3 megohms with 500 volts dc applied. If the system, as a whole, fails to meet these requirements, each individual component will be tested and repaired or replaced if the insulation resistance between ungrounded circuits and ground or isolated conductors or terminals is less than 25 megohms. Refer to chapter 6, section XVII, for instructions on maintenance of electrical equipment. a. REMOTE CONTROL SYSTEM M15. (1) Check all electrical connections to see that they are clean and tight and inspect cable assemblies for worn or damaged insulation. (2) See that the oil gears are filled to proper level with the correct grade of oil. (3) Operate the controls and observe whether the gun responds smoothly and promptly. (4) Refer to TM 9-1678 for detailed inspection instructions for remote control system M15. b. LOCAL CONTROL SYSTEM M16A1. (1) Make a general inspection of the oil gears, drive controller, and wiring set components, checking to see that connections are dry, clean, and tight and the insulation on cables is in good condition. Observe the crystals in all desiccators to determine if they have turned color. To be effective, crystals should be blue. (2) Check the oil level in the oil gears. (3) Move the drive controller to the operating and the non-operating positions. Check for freedom of movement. (4) Refer to pertinent publications for detailed inspection instructions for local control system M16A1. (5) Refer to TB ORD 350 for moisture and fungus proofing treatment. Tools and equipment and additional spare parts over and above those available to the using organization are supplied to ordnance field maintenance units and depot shops for maintaining, repairing, and/or rebuilding the materiel. Parts are listed in the Department of the Army Supply Catalog ORD 8 SNL A-50, which is the authority for requisitioning replacements. Parts not listed in the ORD catalog but required by depot shops in rebuild operations may be requisitioned from the listing in the corresponding ORD 9 catalog and will be supplied if available. Standard and commonly used tools and equipment having general application to this materiel are authorized for issue by T/O & E. They are not specifically identified in this manual. The special tools and equipment tabulated in table I are listed in the Department of the Army Supply Catalog ORD 6 SNL A-35, Section 2. The tabulation contains only those special tools and equipment necessary to perform the operations described in this manual, is included for information only, and is not to be used as a basis for requisitions. CARRIER, gun barrel 41-C-430 To support the rear of the barrel assy when removing it from the gun. Refer to TM 9-251. CARRIER, gun barrel 41-C-435 7 To support the rear of the barrel assy when removing it from the gun. Refer to TM 9-252. CASE, S, empty, spring compressor height 8 1/4 in, lgh 32 in. 41-C-467-75 7 To store recuperator spring compressor 41-C-2555-800. CLIP, charger, M1 76-1-373A To assemble four rounds of ammunition for insertion into the loader of the gun. Refer to TM 9-251 or TM 9-252. COMPRESSOR, spring, automatic loader feed rod. 41-C-2555-75 8,48 33 f (3) To compress the feed rod spring during removal and installation of the feed pawl holding assy. COMPRESSOR, spring, recuperator, screw type. 41-C-2555-800 7,21 29 c To remove and install the recuperator spring. EXTRACTOR, cartridge, hand, lgh overall 13.43 in. 41-E-520-100 8 To remove cartridge case if extractors fail. To remove breech ring crank assy. Refer to TM 9-251 or TM 9-252. EXTRACTOR, spindle and safety plunger, sq body, width of body 3/8 in, lgh overall 7 1/2 in. 41-E-600 8 To lift the breech ring safety plunger (M1 gun only) and to remove the extractor spindle. Refer to TM 9-252. GAGE, chambering 41-G-96-150 9 To measure amount of erosion of tube forcing cone. GAGE, firing pin protrusion 41-G-182-300 8 To determine if the protrusion of the firing pin is within the specified limits. Refer to TM 9-251 or TM 9-252. KEY, side cover, w/removable pin handle, lgh overall 3 1/2 in. 41-K-82-900 9 To lock and unlock the gun breech side cover. Refer to TM 9-251 or TM 9-252. LIFTER, automatic loader, front 41-L-1380 7 To remove and install the automatic loader. Refer to TM 9-251 or TM 9-252. LIFTER, automatic loader, rear 41-L-1380-50 7 To remove and install the automatic loader. Refer to TM 9-251 or TM 9-252. PUSHER, shell, lgh overall 26 3/4 in 41-P-5300 9 To unload cartridges remaining in the automatic loader at the conclusion of firing or initial loading. Refer to TM 9-251 or TM 9-252. REMOVER, cartridge 41-R-2370-120 9 To remove cartridges from automatic loader. Refer to TM 9-251 or TM 9-252. SIGHT, bore, complete 41-S-3642-107 To boresight the gun. Refer to TM 9-251 or TM 9-252. WRENCH, flash hider 41-W-1480-50 10 29 b, 31 g To remove and install barrel assy and flash hider. Refer to TM 9-251 or TM 9-252. WRENCH, key, plug, T handle, splined 41-W-1969 10 To remove and install cover on breech ring closing spring case assy. Refer to TM 9-251 or TM 9-252. WRENCH, loading tray and firing pin spring cover bolt. 41-W-645-575 10 To remove and install loading tray bolt and firing pin spring cover. WRENCH, rammer spring seat (pin type face spanner, c to c of pins 1.46 in, lgh 6 in). 41-W-3247-708 11,35 33 b (5), 35 i (3). To remove and install rammer spring seat. Where the use of an item is not indicated, the nomenclature is self-explanatory. 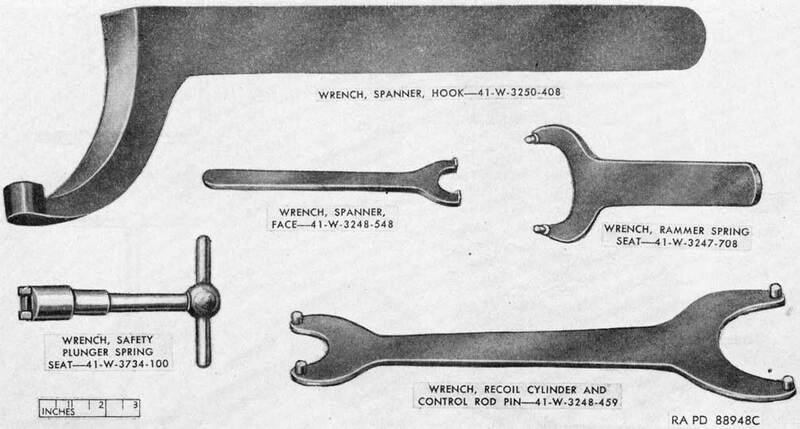 WRENCH, recoil cylinder and control rod pin (pin type face spanner, c to c of pins 1.97 and 3.75 in, lgh 12.937 in). 41-W-3248-459 11 37 c, d, e, 39 b, c. To remove and install recoil cylinder collar and piston rod bushing. WRENCH, recuperator spring collar (comb pin type face and pin spanner, c to c of pins 4 13/16 in, diam of circle 8 in, lgh 17 1/2 in). 41-W-3252-90 10, 22, 23, 26 29 d, e, 31 c, f To remove, install, and adjust the barrel guide sleeve and locking collar. WRENCH, safety plunger (M2 dual gun only). 41-W-2240 10 To retract the breech ring safety plungers. Refer to TM 9-251. WRENCH, safety plunger spring seat (sgle-hd socket, pronged, No of prongs 2, lgh 4 5/8 in). 41-W-3734-100 11, 73 41 b, 43 b To remove and install the safety plunger spring seat. WRENCH, spanner, face, flat key type, diam of circle 1 in, lgh 6 3/4 in. 41-W-3248-548 11 37 c, 39 b To remove and install recoil piston rod metering bushing. WRENCH, spanner, hook, diam of circle 5.196 in, lgh 18 in. 41-W-3250-408 11, 23 29 e, 31 e To disassemble and assemble barrel assy. AMMETER, dc portable, 50 scale divisions, triple range 0-0.1, 0-1, and 0-10 amps, in case, w/two 24 in test leads and connections. 17-A-6730 12 15 d To check current in electric brake system. COMPRESSOR, spring, equilibrator, screw type. 41-C-2555-270 12 To remove and install the equilibrator springs. Refer to TM 9-252. WRENCH, elevating mechanism worm wheel bearing cap. 41-W-1977-100 14 72 c (5), 74 a (8). To remove and install elevating mechanism worm wheel bearing cap. WRENCH, equilibrator bushing nut (sgle open end, size of opng 1 15/32 in). 41-W-1578-100 14 64 f To adjust the compression of the equilibrator springs. To hold the bushing nut during removal and installation of the equilibrator rod jam nut. WRENCH, hub cap (sgle-hd offset box, oct, size of opng 3 9/16 in). 41-W-639-720 15 133 c (1), 135 a (9), 136 b, d. To remove and install hub caps. WRENCH, leveling jack screw nut (pin type face spanner, c to c of pins 2 3/8 in, lgh 10 3/8 in). 41-W-3248-490 14 142 g, 144 b, c. To disassemble and assemble leveling jacks. 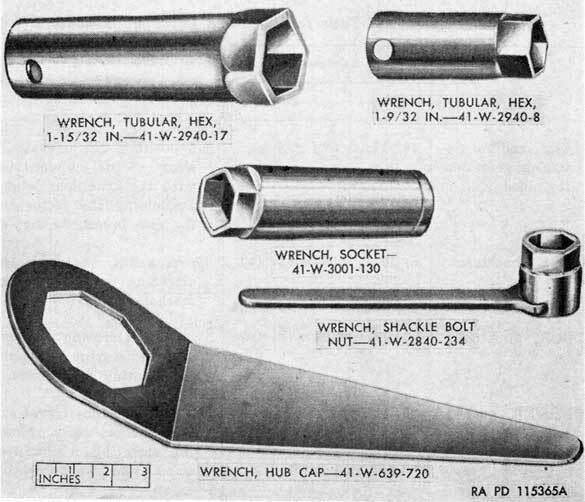 WRENCH, shackle bolt nut (sgle-hd offset, hex, size of opng 1 17/32 in, lgh 9 1/2 in). 41-W-2840-234 15 112 b (2), 112 f (6), 116 b (3), 116 f (3). To remove and install shackle bolt nuts. WRENCH, spanner, hook, diam of circle 3 1/8 in, lgh 10 1/2 in. 41-W-3250-242 14 72 a (5), 74 c (4). To remove and install bearing caps of elevating and traversing hand operating mechanisms. WRENCH, swivel nut, lgh 15 in 41-W-3417 14 113 a (4), 113 c (6). To remove and install the swivel nut of the swivel bearing assy. * Where the use of an item is not indicated, the nomenclature is self-explanatory. For 40-mm AA gun carriage M2A1-Cont. WRENCH, tubular, sgle-end, pronged, 1 1/2 in hex male drive, OD 1 11/16 in, No of prongs 4, lgh 2 1/8 in. 41-W-3736-200 14 130 b (4), 130 d, (4), (5). To remove and install outrigger hinge pin nuts. COMPRESSOR, spring, equilibrator, screw type, assy. 41-C-2555-270 12 To remove and install the equilibrator springs. Refer to TM 9-252. WRENCH, tubular, sgle-end, hex, size of opng 1 15/32 in, lgh overall 7 in. 41-W-2940-17 15 To remove and install the equilibrator rod jam nut. (Used with handle-41-H-1549-522.) Refer to TM 9-252. COMPRESSOR, spring, equilibrator, rtc type, assy. 41-C-2555-230 12 To remove and install the equilibrator springs. Refer to TM 9-251. WRENCH, equilibrator bushing nut (sgle open end, size of opng 1 15/32 in). 41-W-1578-100 14 172 d To adjust the compression of the equilibrator springs. To hold the bushing nut during removal and installation of the equilibrator rod jam nut. WRENCH, socket (detachable) 1/2 in sq-drive, 6 point, extra deep, size of opng 1 5/32 in, lgh 7 in. 41-W-3001-130 15 To remove and install the equilibrator rod jam nut. Refer to TM 9-251. Figure 7. 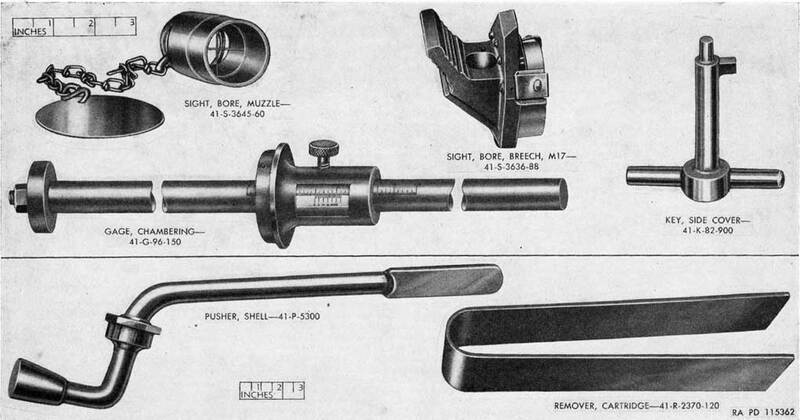 Maintenance tools for barrel and automatic loader. Figure 8. 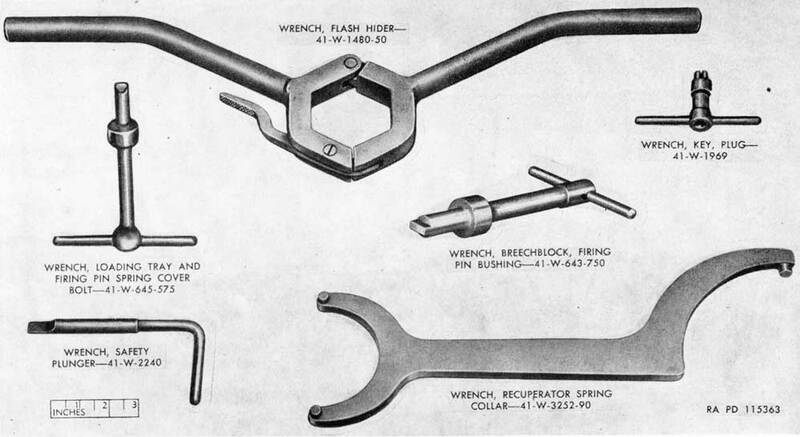 Maintenance tools for automatic loader and breech ring. Figure 9. 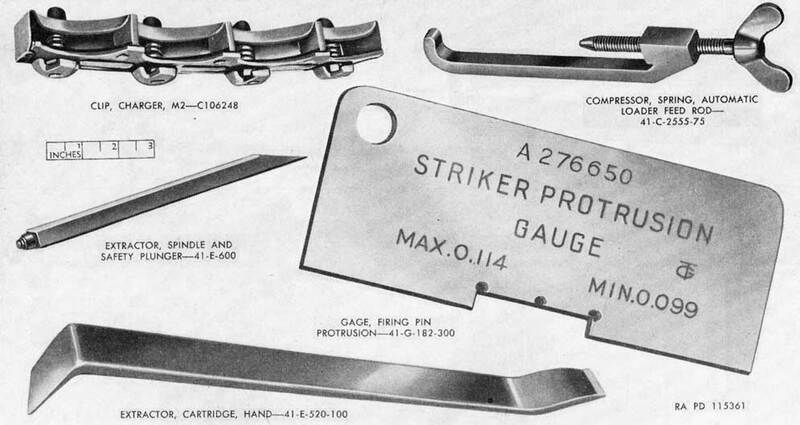 Maintenance tools for barrel, automatic loader, and breech casing. Figure 10. 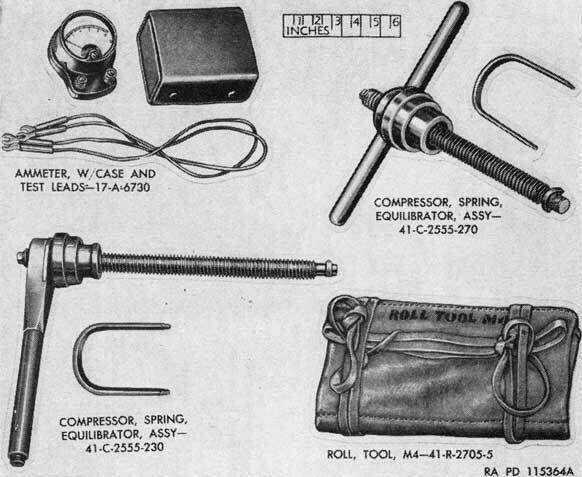 Maintenance tools for barrel, automatic loader, and breech ring. Figure 11. Maintenance tools for automatic loader, breech ring and recoil cylinder. Figure 12. Maintenance tools for equilibrators and electric wheel brakes. Figure 14. Maintenance tools for elevation and traversing mechanisms, chassis, equilibrators, and leveling jacks. Figure 15. Maintenance tools for equilibrators, elevating and traversing mechanisms, and axles. Information furnished in this paragraph is intended for depots, arsenals, and all other corresponding organizations performing major overhaul work on the breech casings and elevating gear sectors, equilibrators, and elevating and traversing mechanisms. The chief value of these tools is to maintenance organizations engaged in rebuilding a large number of identical components. 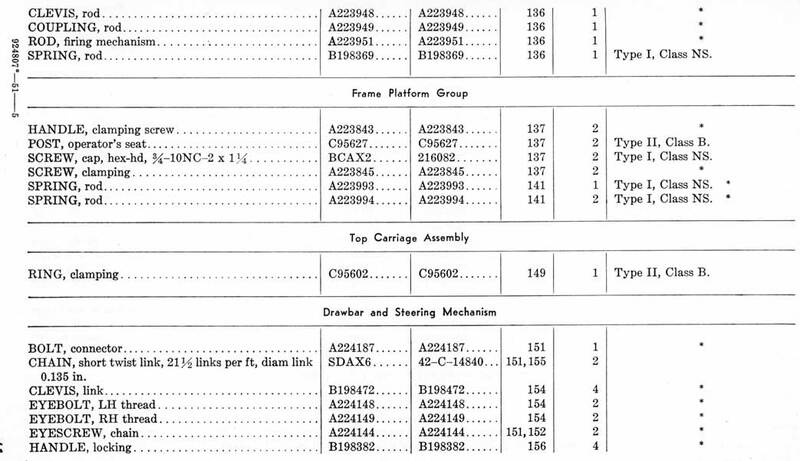 These tools are listed in table II and are not available for issue; the list is furnished for information only. BARS, radius, elevating gear sector alining. 16, 17, 18. 59 i To position the elevating gear sector concentric with the trunnions when assembling the sector to the gun breech casing. GAGE, backlash 5, 19, 252, 253. 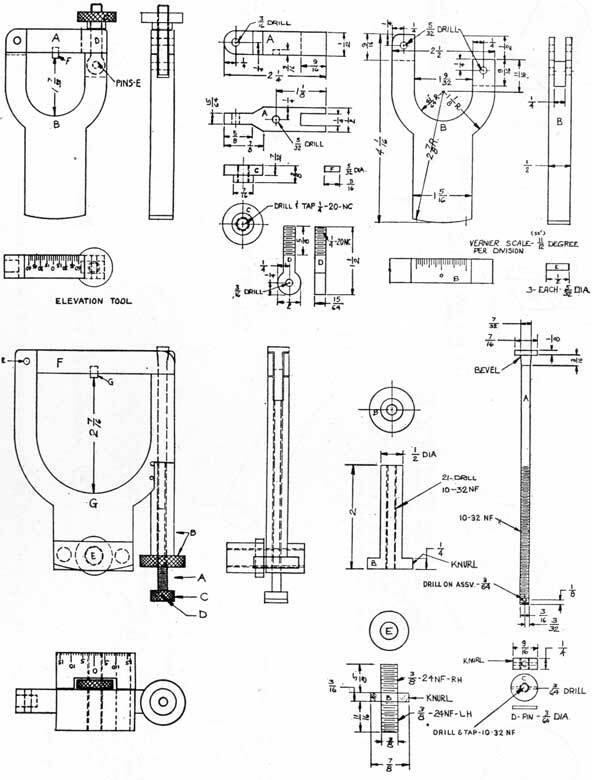 194 a (2) (b) To measure backlash in elevating and traversing mechanisms. LOCK, pinion 20, 251 194 a (2) (b) To lock elevating pinion when measuring backlash in elevating mechanism. PUSHER, gear 20, 111 72 c (11) To remove the elevating mechanism worm from the elevating mechanism worm and worm wheel case. SLEEVE, oil seal installing. 20 74 a To install oil seal on elevating mechanism worm. SPACER, equilibrator rod. 20 63 b To remove equilibrator from carriage M2A1 and mount M3. Figure 16. Improvised elevating gear sector radius bars-assembled. Figure 17. Upper parts of elevating gear sector alining radius bars. Figure 18. Lower parts of elevating gear sector alining radius bars. Figure 19. Improvised backlash gage. Figure 20. Improvised maintenance tools for equilibrator and elevating mechanism. This chapter contains important general maintenance information and also specific maintenance which must be done by ordnance personnel. In the chapters following, characteristics of major units are analyzed and adjustments, repairs, and overhaul and rebuild procedures are described. a. The term "field maintenance" is defined as "care taken, and work done, including minor repairs, to keep any item of materiel or equipment in specified condition." 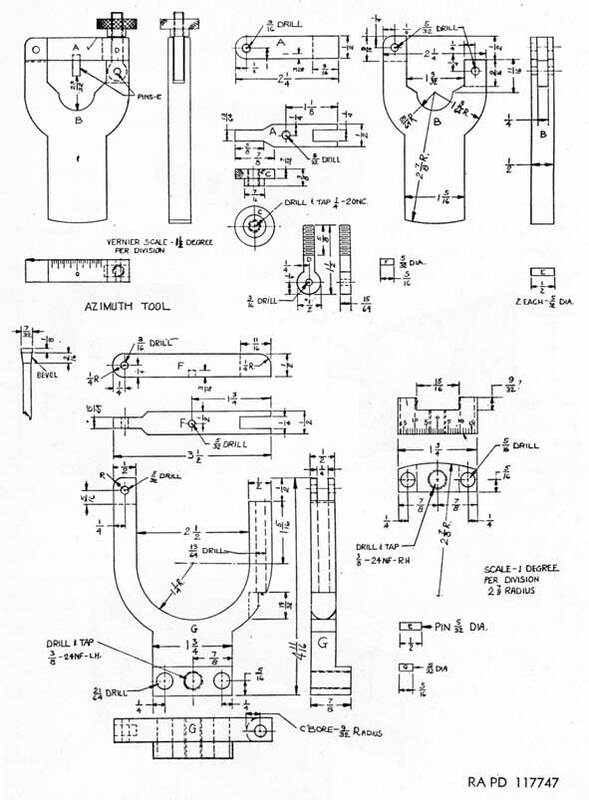 As used in this technical manual, the term "overhaul and rebuild" is defined as "the restoration of an item to a serviceable condition by thoroughly disassembling its subassemblies and assemblies, by inspecting, replacing parts and necessary boring, grinding, machining, or similar operations, followed by reassembly and final inspection." b. 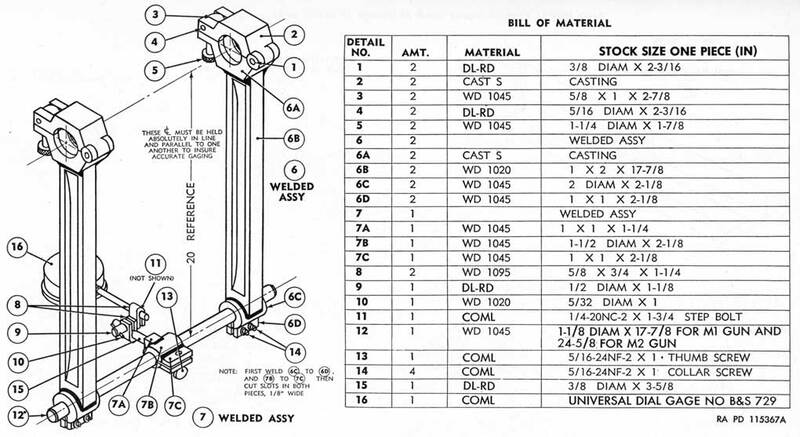 The purpose of overhaul and rebuild is to put a given item of equipment in such condition that it differs from a similar new item only in that certain specified parts may be worn so that they do not meet the dimensional tolerances for new parts and that certain specified performance requirements may be less rigid than those which must be met for the acceptance of a new item, in accordance with overhaul standards in TB ORD 256.
c. The wear tolerances and performance requirements are specifically identified in subsequent paragraphs of this technical manual. Note. The general methods given below should be carefully observed during repair and overhaul operations. a. DISASSEMBLY AND ASSEMBLY PROCEDURES. (1) In disassembling a unit, remove the major subassemblies and assemblies whenever possible. Subassemblies may then be disassembled, as necessary, into individual parts. (2) During assembly, subassemblies should be assembled first and then installed to form a complete unit. (3) Complete disassembly of a unit is not always necessary in order to make a required repair or replacement. Good judgment should be exercised to keep disassembly and assembly operations to a minimum. (1) When assembling a unit, replace taper pins and cotter pins with new ones, if possible. If screws or nuts are damaged, they should be replaced. (2) All springs should be replaced if they are broken, kinked or cracked, if they fail to function properly, or if they fail to meet specific requirements. (3) If a required new part is not available, reconditioning of the old part is required. Such parts should be examined carefully after reconditioning, to determine their suitability. (1) Care must be exercised to use tools that are suitable for the task to be performed in order to avoid unnecessary mutilation of parts and/or damage to tools. (2) A number of special tools (ch. 3) are provided for maintenance of the gun and carriage or mount. These tools should be used only for the purpose for which they are intended. d. REPAIR AND REPLACEMENT OF BUSHINGS. (1) Minor scratches or abrasions on bushing surfaces may be removed. If a bushing is drilled or has a groove to provide lubrication, be sure these openings are clean before assembling the parts. (2) Extreme care must be exercised in installing Oilite type bushings. An arbor press should be used, if possible. If an arbor press is not available, hold a clean wood block against the bushing and strike the block with a hammer. Start the bushing straight and avoid cocking it in the bore. (3) Bushing clearances should give the desired shaft fitting. (4) Scraping, burnishing, or reaming of undersized Oilite type bushings is not recommended. An Oilite type bushing may be sized by forcing a steel ball of correct diameter through the bore by means of an arbor press. If reaming must be resorted to, it should be done after installation. Be sure to clean the surface thoroughly after reaming. e. REMOVAL AND INSTALLATION OF BALL AND ROLLER BEARINGS. There are several rules consistent with established shop practice that should be observed in the removal and installation of ball and roller bearing assemblies. Strict adherence to these rules will reduce the quantity of damaged bearings received at reclamation stations. Refer to TM 37-265 for information on care and maintenance of bearings. f. WELDING AND RIVETING. For welding instructions and welding materials, refer to TM 9-2852 and Department of the Army Supply Catalog ORD 3 SNL K-2. (1) As assemblies are removed and disassembled, the parts should be thoroughly cleaned of all grease, oil, water, and dirt. They should be dried with wiping cloths and then coated with the lubricant prescribed in the lubrication orders to prevent rusting while disassembled. (2) Bearings require special attention in cleaning and oiling. After removing the surface dirt and oil or grease, the bearings should be placed in hot oil (about 140° F.) to loosen congealed oil and grease. After cleaning, the bearings should be coated with a film of lubricant and wrapped tightly in oiled or waxed paper until inspection and assembly of parts. Note. Sandblasting is permissible on nonworking surfaces for removal of dirt, paint, and rust. After overhaul has been completed, the use of steam or high pressure stream of water is prohibited. (1) Repaint all surfaces on which paint has deteriorated or become damaged. (2) Do not paint the working parts inside breech casing. (3) Do not paint seats for gunner's quadrant on top of breech casing. (4) Paint three-quarter-inch red circle around lubricating fittings. (5) Do not paint rubber surfaces or electrical parts. Note. For detailed information on painting, refer to TM 9-2851. For information on corrosion resistant finishes, refer to paragraph 27.
i. REPAIRING DAMAGED THREADS. Damaged threads should be repaired by use of a thread restorer or by chasing on a lathe. (1) All lubrication and grease packing operations mentioned in subsequent paragraphs in this manual must be performed in accordance with instructions given in LO's 9-252,9-252-1, and 9-757. (2) Caution tags will be attached to the hand operating cranks of the materiel, noting the operational ranges of temperature for which this materiel has been lubricated, except in those instances where corrosion preventives, which must be removed prior to operation, are prescribed. In this latter event, the caution tag will instruct that the corrosion preventive will be removed and the subassembly lubricated before the materiel is issued to the using organization. Protection of materiel, with prescribed preservatives, will be performed, whenever possible, simultaneously with inspection. This applies to materiel either to be shipped or to be stored. a. 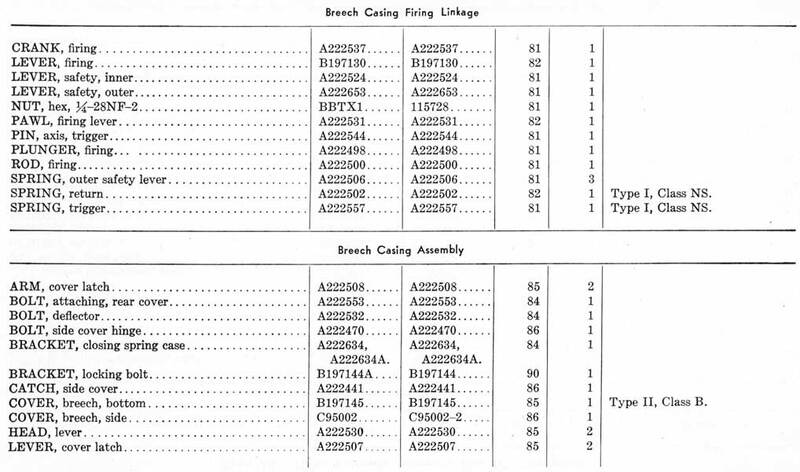 Items listed in tables III and IV are considered critical items on which surface treatment is required at time of overhaul and rebuild. Treatment (depot maintenance only) is to be in accordance with USA Specification 57-0-2C, Amendment 2, dated 16 January 1945 or later revisions thereof. b. In addition to the items listed in tables III and IV, all items which do not conform to the latest revised drawings with regard to finish treatment, will be treated. 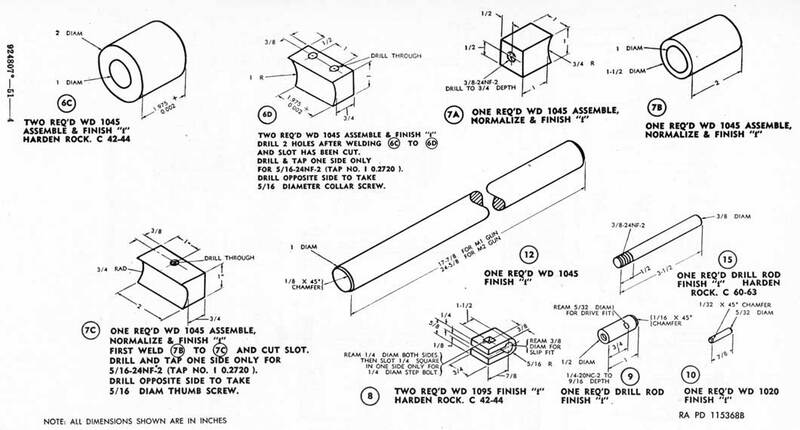 Any noncritical items (items not included in tables III and IV) on which finish has broken down and all standard hardware removed during disassembly will also be treated in accordance with the specific drawing and USA Specification 57-0-2C. c. Items having brass parts permanently attached, such as the breech ring-E1251, may be treated by pickling with phosphoric acid instead of hydrochloric acid prior to applying the protective finish. Phosphate finish is to be applied on only the outside of gun tube-D50007-1; painting of the tube is unnecessary after treatment. d. Unless otherwise noted, finish is to be type II, class A. Items marked with an asterisk (*) indicate that the drawing has not been revised to show type of surface treatment required.